Qu. 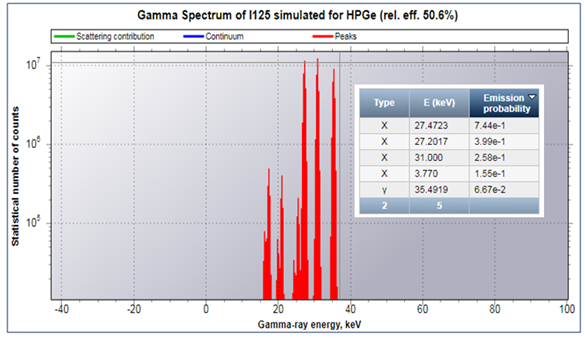 (from Z. S. JRC Karlsruhe) Using the Gamma Spectrum Generator app in Nucleonica I have created a gamma spectrum for I-125 (shown below). Comparing the results from the Nuclide Datasheets++, I find the three lines at approx. 35, 31, 27 keV (see inset from the Datasheets++). Where do the extra peaks at approx. 21 and 17 keV come from? The additional lines from the I-125 spectrum are X-escape peaks. The relative intensities correspond about to the relative Ge X-ray intensities. – What type of data is collected by Nucleonica? – How long is my user data stored? Because of recent problems, the Feedburner service for managing RSS feeds has been deactivated. 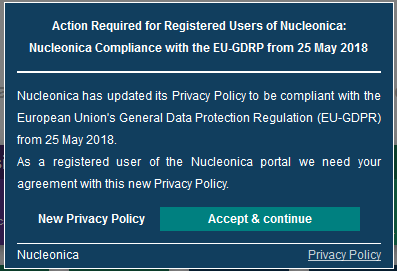 The Nucleonica Blog posts are now sent directly to Nucleonica’s Networking page using the WordPress feeds. Users can no longer receive these post feeds via email. However, the most recent feeds are shown directly on the Networking page.